Isn’t it convenient to know estimated fares before ordering a trip? The upfront pricing model allows to see how much your ride costs before you request it. No surprises or complicated maths – just sit back and enjoy your ride! How to know my Uber ride cost? Uber uses a model called dynamic pricing. So, when the demand is really high, a multiplication factor is applied that increases fares in real time. The fare estimates take the factor into consideration. If dynamic pricing is active at the moment you are checking trip cost, you will see a notification above the estimated fares. You can also receive a notification that shows you the multiplication factor once you push the confirmation button. For example, if there is a traffic jam, you will receive a notification saying that trip fare is surging by 1.5x. That means that trip cost is 1.5 higher than usual fares. 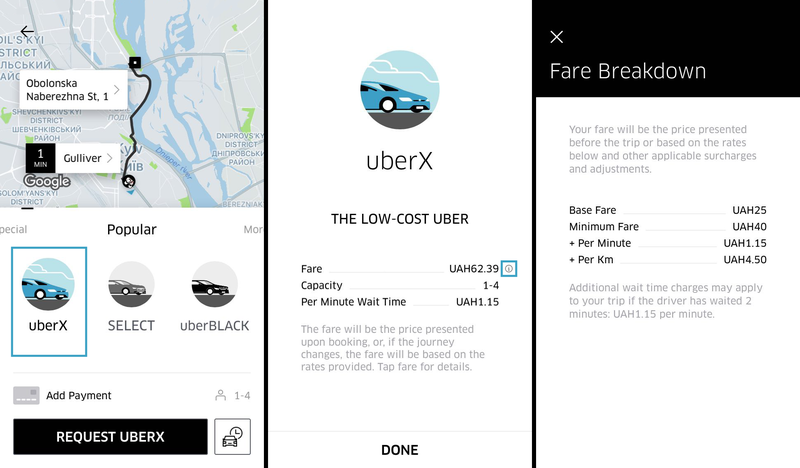 How Uber app determines the upfront price? Upfront fares are calculated using the expected time and distance of the trip and local traffic, as well as how many riders and nearby drivers are using the app at that moment. What if I change my destination, have multiple destinations or make extra stops? If you have multiple stops or have to change your destination mid-trip, don’t worry! When this happens, the final fare to be charged will differ from the upfront fare quoted at the start of the trip. We recommend to add all your destinations before ordering a car. Why my upfront fare was not honoured? Your upfront fare may differ from the amount that is actually charged for the following reasons: change of destination or pickup location, changes in route. Can my trip cost change if I don’t change my destination? Yes, if your route changes considerably. I have added a promo code, will it be displayed in the upfront fare? Yes. If you have a valid promo code, it will be automatically applied after a trip, and your upfront price will include the discount. Learn how to add a promotional code in our blog.